Before one of my friends moved to Boston, MA, we were hanging out near where he used to live in Rhode Island. A few hours after dinner, we were hankering for a taco and he suggested that we head to Tacos Don Nacho for a taco fix. 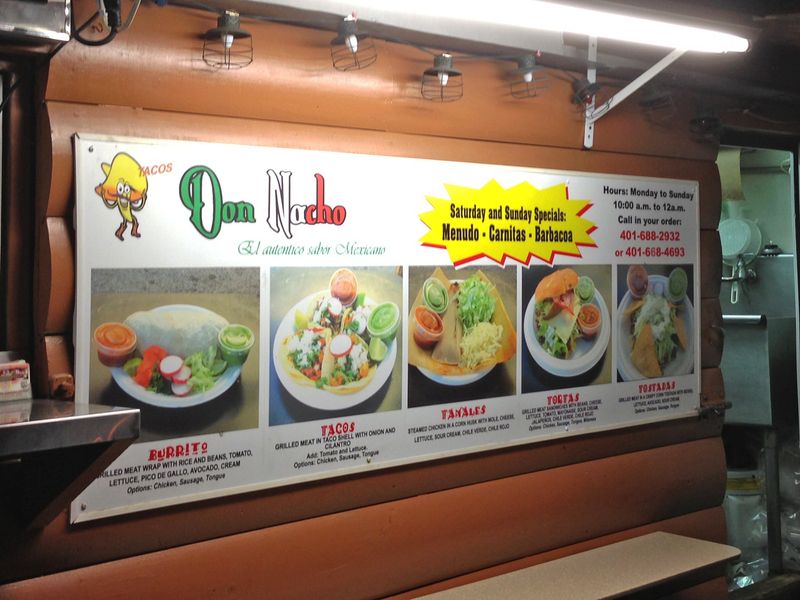 I had seen Tacos Don Nacho before while driving by, but it never really occurred to me to stop there. It’s the kind of place you might overlook without a recommendation from a good friend. I know I won’t be making the mistake of overlooking Tacos Don Nacho again if I’m in the area and itching for some authentic food from central Mexico. Tacos Don Nacho is a restaurant visited by those “in the know,” because if I’m being honest, there are so many superficial red flags that would deter a person seeking an authentic Mexican meal from going there! For example, as far as authenticity goes, the word, “Nacho,” in America has come to mean a variety of inauthentic references to tortilla chips smothered in cheese. That’s not the case at the Tacos Don Nacho restaurant, however, which is aptly named after its owner whose name is (you guessed it), “Nacho!” Nacho, Sr. has a son also named, “Nacho,” and another son, Fermin, who help him run the truck. The next red flag would be the giant plastic horse that “pulls” the taco carriage and which is ridden by a mustachioed mannequin. I’m really not making this up. Luckily, this is a classic lesson in not judging a book by its cover. The Don Nacho truck/trailer was there well before the food truck boom a few years ago and decorated itself to attract attention. It’s also one of those rare trucks that has an address. The truck is such an established structure that it is surrounded by a chain-link fence that is locked when the restaurant is closed. 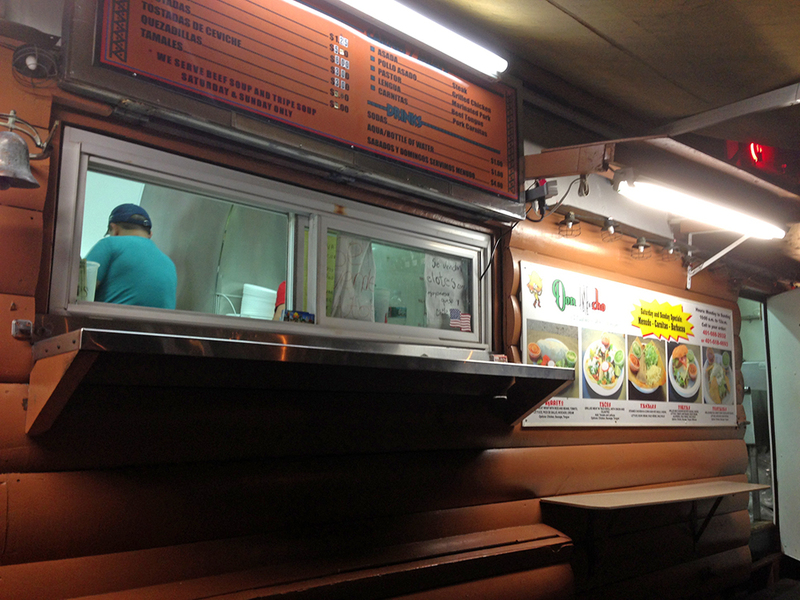 There is no indoor seating, so patrons order from a window and wait to get their food to go. As soon as the food is ready, one of the employees reaches out and dings a bell to signal the eagerly waiting people. Many of the Spanish-speaking patrons (another good sign that a restaurant makes good Mexican food) order beef tongue or roast pork from the meat options to fill their dish of choice. When I finally had the chance to visit Don Nacho, I had just watched an episode of Bizarre Foods America and was looking forward to trying some of the beef tongue (“lengua” in Spanish). Unfortunately for me, it was late at night near closing time and apparently they had already run out! I ordered pork and beef instead for my three tacos. 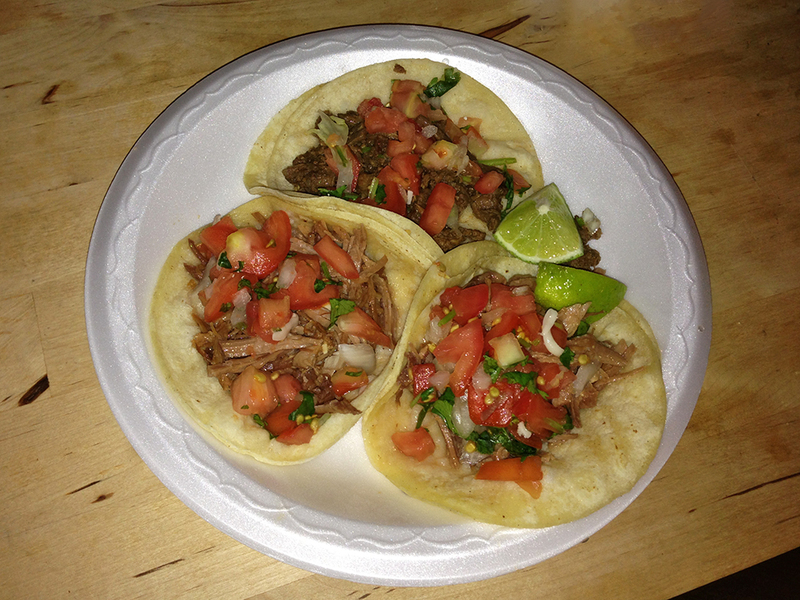 When I took a good look at my tacos (see the picture), I could immediately see how good they were. The classic, warm, double corn tortilla struggled successfully to hold the delicious fillings, which were obviously fresh. Bright red, firm tomatoes, crunchy onions, and unwilted cilantro paired beautifully with the juicy meat. It’s easy to spot a bad taco when the vegetables are watery or wilted and the meat is dry, but Tacos Don Nacho knows how to make a taco. A little splash of their hot sauce and a squeeze of lime and three tacos isn’t enough to satisfy. Tacos Don Nacho is a wonderful find for anyone that needs a quick taco, quesadilla, or just good Mexican food in general. Sometimes the lines or wait times get a little long later at night, but that’s expected when people are making fresh food. The inexpensive price point is also a huge bargain. I would easily recommend Tacos Don Nacho for simple, authentic, Mexican Food that delivers on flavor. Very, very appetizing. LOL for a food truck that has an address.